As much as I love baking and gifting treats to other people, there are times when your own homemade goods just aren't feasible. Ie: when you're on a health kick, or when the recipient lives several states away. For these situations, I turn to local Brooklyn husband and wife - run company Whimsy & Spice. I've been sending their gift boxes pretty frequently since 2010, and they work for any occasion you can think of - thank you, birthday, new baby...anything. Once I even sent a box to a very nice man from the airport who shipped me a bottle of wine that I would otherwise have had to throw away because the check bag line was too long. 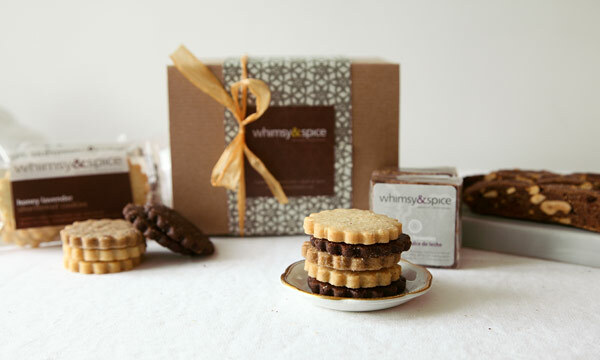 Their baked goods are delicious and refined - with shortbread flavors like fennel olive oil and honey lavender, these gift boxes are definitely suitable for adults. Best of all, they make every box to order, so when I send one I'm confident of the quality. It's seriously the next best thing to baking something myself! There are two sizes of the gift box, classic and deluxe. Beyond shortbread, the boxes include biscotti and brownies (in the classic) plus marshmallows (in the deluxe). You can also order their different items and flavors individually to mix and match. Their products can be found in select retailers (like my beloved Foragers City Grocer) and at Brooklyn Smorgasburg.